...The "malariotherapy" experiments in China, conducted for over a decade by Dr. Chen in conjunction with Cincinnati's Heimlich Institute, have been called "atrocities" by the World Health Organization. Medical experts have condemned the work as "charlatanism of the highest order." Research subjects included prisoners who were controlled by hired guards. In one case, a woman with full-blown AIDS, suffering from pneumonia and hooked up to oxygen, was infected with malaria. ...SLU's school of medicine was awarded a $566,640 National Institutes of Health (NIH) grant...A (SLU) spokeswoman confirms to Daily RFT that this grant is part of the GIBH project. Page down for a letter I sent today to the NIH requesting a review of the grant. Click here to download a copy. "Heimlich's life-saving maneuver for people who aspirate food doesn't qualify one as an HIV expert," said leading AIDS researcher Dr. Anthony Fauci, who called malaria therapy "quite dangerous and scientifically unsound." Undoubtedly Dr. Fauci had no knowledge that Chen would be on the receiving end of the NIH's grant to SLU, so I copied him on my letter of today. 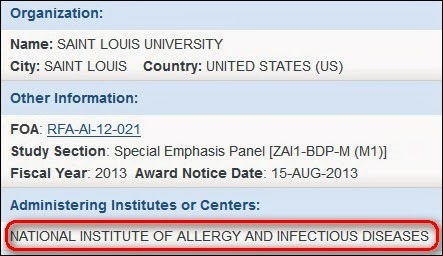 This isn't the first time the NIH has funded Dr. Chen. For my web page documenting the developing SLU/Chen story, click here.